Winterpark Condos: Location, Location, Location!! Look no further, here it is! Just a few minutes from Naples Downtown 5th Avenue! Great shopping, dining, and minutes from the beach! This condo comes turn-key. Offers a brand new stainless steel refrigerator, nicely renovated kitchen and bathrooms, along with plantation shutters, recently painted, wheel-chair access doors. Extra storage under the staircase for bikes, grill, golf clubs and more. The community offers a resort-style pool and brand new renovated club-house, tennis courts, pickleball courts. This is a pet friendly community also! Call now for your private tour. Winterpark Condos: RECENTLY RENOVATED condo in Winterpark. Two bedrooms, two baths, large walk-in closet, large oversized laundry/storage room, plus additional storage under the stairs. Screened in porch, new flooring and light and bright any time of day. Bathrooms are both remodeled and this condo offers an open dining/living room with a breakfast bar as well as a breakfast nook in the kitchen. AMENITIES GALORE in this community including a resort style pool, tennis courts, bike and jog paths and a clubhouse for other activities. Highly sought after location, close to Publix shopping plaza, Starbucks and downtown Naples finest restaurants and shopping. LOWER HOA FEES. Winterpark Condos: Spacious 2 Bedroom, 2 Bath 1st Floor Unit in Winterpark-- active community in the heart of Naples with low HOA’s! Perfect Home for Seasonal or Full Time Resident. NEW 2018 IMPACT glass windows & doors, NEW 2016 split system A/C, NEW 2017 ROOF. Master bedroom has walk in closet & ensuite bathroom. Large laundry room; storage area. Murphy bed with storage and desk station in guest bedroom. Screened in front patio. The WINTERPARK Community features a Fabulous Resort Style Pool with Clubhouse, Bike & Jogging Path, Tennis, Pickle Ball and Bocce Ball Courts. Only Minutes to the Downtown 5th Avenue Entertainment District and Beaches. Schedule your private showing today! Winterpark Condos: Location, Location, Location!! This beautiful 1st floor, 2 bedroom/2 bathroom condo is available at Winterpark. Completely upgraded and move-in ready. Recent improvements include laminate and tile flooring throughout, kitchen cabinetry, interior paint, granite countertops, stainless steel appliances, tile backsplash, new plumbing throughout, impact glass slider door in kitchen, washer & dryer, bathroom vanities & countertops, fixtures & hardware, interior doors and so much more! This unit offers a wonderful open floor plan, with a large living area to entertain, bright kitchen with breakfast bar, large bedrooms, and a laundry room with extra storage. Winterpark offers one of the largest resort style pools in Naples, tennis & pickleball courts, bocce, and a community clubhouse that organize activities throughout the season. Conveniently located minutes from downtown Naples and it's world-renowned beaches, restaurants, and shopping. This condo is a must-see! Winterpark Condos: Newly renovated, granite in the kitchen, tile on the floor, fully remodeled bathrooms, new paint throughout the apartment. Excellent location in the heart of Naples, you must see it, you will love it !!! Winterpark Condos: Wonderful community close to downtown. This sought after street is walking distance to the pool. A well maintained second floor unit with tile floors throughout the unit. It offers 2 bedrooms, 2 bathrooms split floor plan with upgraded windows in 2007. Winterpark is an active community that enjoys their very large resort pool, newly renovated clubhouse, bike storage, tennis, pickleball, bocce ball, walking trail to stores/restaurants and 7 minute drive to the beautiful beaches and downtown. Winterpark Condos: Located in Winterpark this condominium is a end unit on the ground floor. Features 2 bedroom, 2 bathrooms. Floors are tile throughout except in guest and master bedroom which have bamboo flooring. Master bedroom has a Master bathroom that has been updated bathroom vanity has granite countertops and a walk-closet. kitchen has been updated and has sliders out to the screen-in lanai. Spacious laundry room located inside the condo. Extra storage outside near front door. Resort style community pool, clubhouse, library, tennis courts, pickle ball court and bocce ball. Community allows 1 pet with approval that doesn’t exceed 49lbs. Winterpark Condos: Location! Location! Don’t miss this one, 1st floor 2/2 , updated kitchen and baths with hard surface tops. Laminate flooring in great room. Spacious master with walk in closet. In house large laundry room with an extra refrigerator. Winterpark is a very active community and offers a party room, tennis, pickle ball and a huge resort style pool. 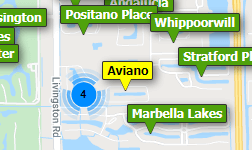 Within walking distance to local shopping and 5 minutes to Naples famous 5th Avenue and it’s white sandy beaches. Winterpark Condos: RENOVATED and UPGRADED condo in Winterpark. Excellent location with easy access to everywhere and everything. Minutes from 5th Avenue, the beaches, restaurants and shopping this 2-bedroom 2 -bath second floor condo has been completely updated and is ready to move in. It offers an open floor plan with neutral tones throughout and a large combination dining and living area for easy entertaining. Kitchen has stainless steel appliances, quartz counter tops, and a large breakfast bar. Over-sized master bedroom with a large walk-in closet, a second guest bedroom with another large closet and both the master bath and guest bath have tile and granite throughout. Add soaring vaulted ceilings, a spacious laundry room with extra storage, custom moldings throughout, upgraded fixtures, a new A/C Unit, an open outdoor deck and a pet friendly community to make this the perfect condo for year-round or seasonal living. Winterpark also offers one of the largest resort style pools in Naples, with tennis and pickle-ball courts, bocce and a recently renovated community clubhouse. Winterpark Condos: C. 15446 Here is your perfect winter retreat! South-facing 2nd floor end unit, overlooking tennis/pickle ball courts. Only steps from the resort style pool. Hurricane-impact windows and slider doors. Tiles throughout. 3 miles from the beach and 5th Ave. South where you can find plenty of upscale shops and restaurants. Winterpark Condos: This 2/2 Second Floor Unit is Spacious and Bright with an Updated Kitchen and screened Lanai off the front...Well maintained and occupied infrequently... Winterpark Community is a well known, established, very friendly community located only a couple miles from downtown 5th Ave Restaurants, Shops, Tin City, Bayfront and Naples Beaches... This is a great, reasonably priced Winter Escape or Investment property... 2019 Seasonal tenant is interested in renting next year if buyer is interested...Please call to View! Winterpark Condos: C.15770 THIS SPACIOUS FURNISHED TURN KEY 2 BEDROOM 2 BATH CONDO IS LOCATED 5 MINUTES FROM THE BEACH, SHOPPING, RESTAURANTS, ENTERTAINMENT, AND NAPLES PIER. FEATURES INCLUDE LAMINATE FLOORS, LARGE BEDROOMS WITH WALK IN CLOSET, EAT IN KITCHEN, BREAKFAST BAR, LARGE LAUNDRY ROOM WITH STORAGE AND MORE. THE COMMUNITY OFFERS, LOW CONDO FEES, A CLUB HOUSE, LARGE COMMUNITY POOL, PICKLEBALLL, AND A TENNIS COURT. DOG’S ARE ALLOWED UP TO 40 POUNDS WITH APPROVAL. A WIN, WIN SITUATION. DO NOT LET THIS GETAWAY. GET OUT OF THE SNOW NOW!!! Winterpark Condos: Immaculately maintained SINGLE OWNER Winterpark Naples 2 bedroom 2 Bathroom condo offered furnished! This is a sought after 1st floor unit. Upon entering the Screened in Front Lanai you walk into the front entry with a pantry/hall closet located right next to the front door and to your right is a spacious kitchen. Continuing into the Great room you will notice how spacious the room feels. A dining area is adjacent to the breakfast bar which all looks out over the private landscaping. A benefit of this first floor unit is the rear door which gives you access to the back yard area. The Master suit is located in the rear of the condo with private views out back. The spacious Walk in closet has plenty of room for all your clothes. This unit is located in Winterpark VII which allows 4 rentals of 31+ days per year immediately. 1 Pet is allowed up to 40lbs with approval.Winterpark is located directly next to the Kings Lake Shopping Plaza with Publix, a Gym, Restaurants and more. Winterpark offers a stunning pool and community room along with tennis courts and Bocce Ball Courts. Located just a short distance from downtown Naples. Winterpark Condos: Location, Location, Location! This spacious 2 bedroom unit has been partially renovated. Eat in Kitchen features lots of cabinets & granite countertops. Enjoy the convenience of full size laundry room, plantation shutters and tile floors. Master retreat features en-suite private bath. Split bedroom floor plan. Screened in Porch, extra outside storage room. Winterpark is centrally located near the famous Naples White Sand beaches,and world class dining. Wonderful resort style pool, clubhouse, tennis courts, pickle ball and bocce ball. Tenant will vacate prior to closing. Great Property, Great Location at a Great Price. This unit is ready for you to call home, schedule a showing today. Winterpark Condos: C.15320 Spend your winter in this well kept 2nd floor unit, 2BR/2BA. Southern exposure, overlooking tennis/pickle ball courts, just steps from one of Naples best and largest resort-style pools. Newer carpet. Winterpark is only 4 miles from the beach and 5th Ave. S. with all the upscale shops and restaurants. Winterpark Condos: C.15590 Location, location, location! Get away from those cold winters! Winter Park is the perfect seasonal getaway or full time residence. This 2 bed 2 bath second floor condo with vaulted ceilings is only 5 minutes to Naples’ famous 5th Ave with upscale shopping, restaurants and entertainment! And don’t forget about the white sandy beaches and the historic Naples Pier! Make it your own! This 1,246 sq.ft. home, which has been freshly painted inside, just needs you to add your own personal decorating touches, ie: carpet/flooring. The spacious master has a walk in closet and ensuite bathroom. There’s a large laundry room with extra space for storage. Winter Park is a very active community and offers a clubhouse/party room, 6 tennis courts, pickle ball and a huge beautiful resort style pool. Nestled in the heart of Naples, and with low HOA’s, you don’t want to miss out on this one. Need professional assistance selling your property at Winterpark Naples? Find out how an Area Specialist can help to generate more property exposure in order to get the most money for your investment in the least amount of time.